Catalyst Architecture is underway on Phase 1 construction documents for the Meteor Crater Visitor Center. Phase 1 consists of a 3,000 sq.ft. new Main Entry structure, intended to provide a climate controlled enclosure for visitors purchasing tickets, as well as a new 'first impression' experience of the facility, based on the 20-year Visioning Masterplan work completed by Catalyst in 2011. 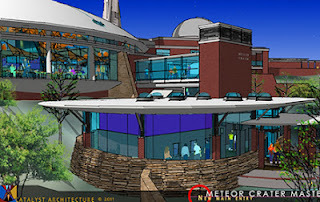 Construction is expected to commence in the fall of 2012. Click here to view renderings from the Visioning Masterplan.